If you have been drawing and modifying artwork in Flash with the Object Drawing option turned off, you've probably noticed that Flash has a unique way of handling lines and fills that reside on the same layer of your document. Items of the same color merge, whereas items of a different color replace or cut out other items where they overlap. Flash treats lines or strokes as separate items than fills, so these can be selected and moved or modified independently of each other, even if they are the same color. Figure 1 shows how Flash allows lines and fills to be selected individually, even if they are the same color. By double-clicking an element, you can select all the related segments. This works for selecting the stroke and fill of a shape or for selecting connected sections of a segmented line (such as the four sides of a rectangle). Figure 1. A gray oval fill with a gray stroke may not appear to have a discrete outline, but Flash allows these two elements to be selected separately. Both lines and fills are divided into segments at points of intersection. 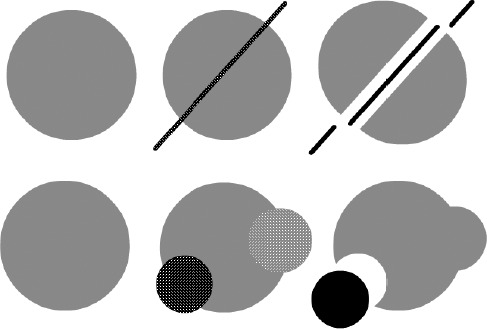 Figure 2 shows a fill split into two independent shapes by drawing a line on top of it (top) or modified by merging with a fill of the same color and being cut out by a fill of a different color (bottom). Figure 2. A fill split by an overlapping line drawn on the same layer (top). Two fills of the same color merge into a compound shape when they intersect on the same layer (bottom). These behaviors can be destructive or helpful to your artwork, depending on how you manage individual elements. The key point to remember is that primitive shapes cannot be overlapped on the same layer while deselected without affecting each other. If items are grouped or converted into drawing objects or symbols, they remain independent and are not compounded or deleted by intersection with other items. Items on layers are also autonomous and do not merge with or erase items that exist on other layers. You can move lines or fills over other primitive shapes without affecting them, as long as they remain selected. As soon as they are deselected, they intersect or merge with adjacent primitive shapes on the same layer. Figure 3 illustrates the process of moving a selected shape over and then off of another shape while keeping the two shapes independent (top), and the result if the shape is deselected while it is overlapping another shape, before being reselected and moved, to create a compound shape (bottom). Although you can use the Movie Explorer to search for some elements in a project file so that they can be modified, it doesn't automate updates in the same speedy way that the Find and Replace panel, shown in Figure 4, does. Find and Replace is opened from the Edit window rather than from the Window menu, but it does open a real panel and not just a dialog box. Although the Find and Replace panel takes up a lot of room on your desktop, you could dock it with other panels for quick access if you prefer that to using the menu or shortcut keys. If you have used the Find and Replace feature in any other application (even in a basic text-editing program), you will be familiar with the main buttons in the Find and Replace panel (Find Next, Find All, Replace, and Replace All). Open the Find and Replace panel by choosing Edit => Find and Replace in the application menu (Ctrl+F/ +F). Figure 4. The Find and Replace panel makes revisions so easy, they're almost fun. 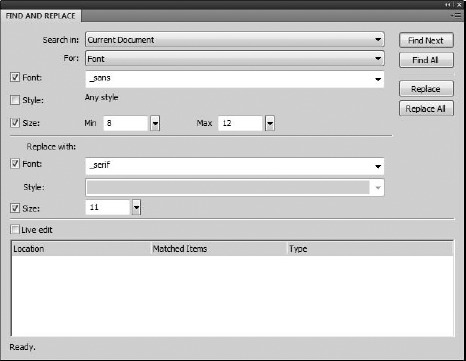 Text: Search for words, partial words, or whole paragraphs in text fields, frames, layers, parameters, strings, or in ActionScript in your current project or current scene. Font: Search for fonts by name, style, and even size, within your current project or scene. Color: Pick a color from the popup swatches (or enter a hexadecimal value in the field) to search for fills, strokes, or text where a specific color is used in the current project or scene. Symbol/Sound/Video/Bitmap: Use the handy drop-down list that lists all symbols (or sounds, or video, or bitmaps) used in your current project to pick a symbol to search for and a symbol to use as a replacement. As you select each item in the For: drop-down list, options relevant to that item become available in the panel. These options give you very precise control over the type of edits that you want to make. Now that replacing a color or font, or even a specific word in your entire project file, is as easy as making a few quick selections in the Find and Replace panel, those dreaded last-minute revisions might almost seem fun. Although any effects or transformations that you have applied to a symbol instance (and any formatting you have applied to text) should be preserved if you change it by using the Find and Replace panel, you have to verify that the newly inserted content appears as you expect it to. If a font is much larger, it might not fit into your layout, or if a replacement bitmap is much larger or smaller than the original, you may have to make some manual adjustments to get everything polished. These are the same kinds of adjustments you would expect to make if you used the Swap symbol feature.